(RRP £299.99). 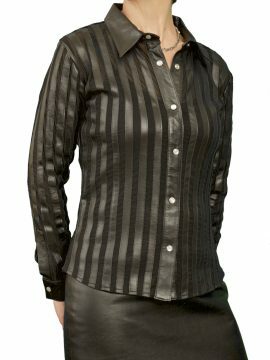 A beautifully-tailored, fine quality long-sleeved women's leather shirt by Ashwood, that has strips of finest soft lambskin nappa leather stitched on to semi see-through stretch lycra on the body and sleeves, which give it a 'slinky' look and feel. You can wear this with anything for smart or smart-casual wear - a skirt, trousers, jeans or leggings. The shirt is styled to be slim-fitting yet comfortable to wear as the stretch of the lycra fabric eases the fit to your body. The collar, sleeve cuffs and front centre (placket) of the shirt are in leather. There are pearl-covered metal popper stud fasteners on the front and sleeve cuffs. Available in black or an eye-catching 'vermillion' red. NOTE: We also have this as a men's shirt in black (click here). *** Please Note: Your shirt bust size WILL NOT be the same as your bra size – therefore, please measure (with a good tape measure) around the fullest part of the chest. *** Please see our Product Description below for full details and important Sizing Information. (RRP £129.99). A well-tailored ladies leather waistcoat in soft black lambskin nappa. A versatile garment that you can wear for both casual and smart wear, open or closed, with jeans, trousers or skirt. It is tailored in slightly at the waist but has a more generous fit than our other women's waistcoats. 5 button front fastening. Fully lined. By Ashwood. *** Please Note: Your waistcoat bust size WILL NOT be the same as your bra size – therefore, please measure (with a good tape measure) around the fullest part of the chest. *** Please see our Product Description below for full details and important sizing information. (RRP £299.99). 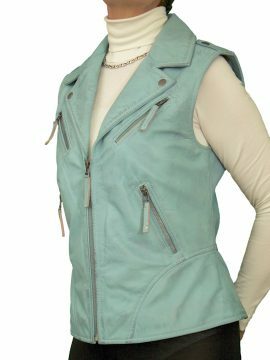 A very classy, fine quality womens leather gilet waistcoat in soft lambskin nappa leather with a special waxed finish that gives a subtle shading effect on the lighter shades. Available in sky blue, wine red and mustard yellow - 3 exciting colours to brighten up your outfit at any time of year - as well as black. Perfect for smart-casual wear with leggings, trousers, jeans, shorts - or even a skirt! The gilet is expertly tailored for a stylish fit and has a front metal zip fastening. There are short metal zips are on the slant front pockets and at the rear hem, plus metal studs on the lapels and epaulettes. It is fully lined with a lovely floral print fabric (100% polyester). By Ashwood for Tout Ensemble. Also in larger sizes for the fuller figure. *** Please Note: Your Gilet bust size WILL NOT be the same as your bra size – therefore, please measure (with a good tape measure) around the fullest part of the chest. *** Please see our Product Description below for full details and important sizing information. (RRP £299.99). (Collar can be worn 'Up' or 'Flat'). 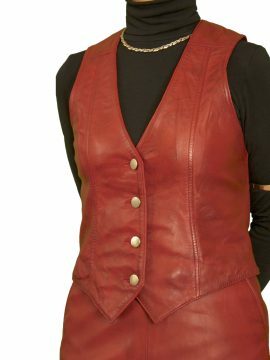 A very fine ladies leather gilet waistcoat. It is exquisitely tailored in lightweight black luxury soft lambskin nappa and so it feels light and is not a heavy or bulky item, making it just beautiful for smart-casual wear at any time of year. It has a full front metal zip fastening that reaches to the top of the collar so you can either wear fully closed as a stand-up collar or partially unzipped and fold the collar down. The gilet has two side slit pockets and it is fully lined. By Ashwood for Tout Ensemble. *** Please Note: Your Gilet bust size WILL NOT be the same as your bra size – therefore, please measure (with a good tape measure) around the fullest part of the chest. *** Please see our Product Description below for full details and important sizing information. (RRP £299.99). (Collar can be worn 'Up' or 'Flat'). 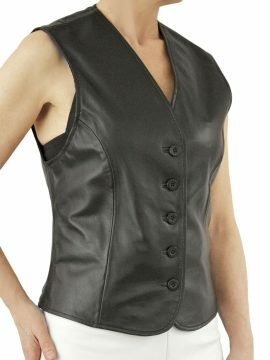 A very fine ladies leather gilet waistcoat, exquisitely tailored in lightweight black luxury soft lambskin nappa and so it feels light making it just beautiful for smart-casual wear at any time of year. 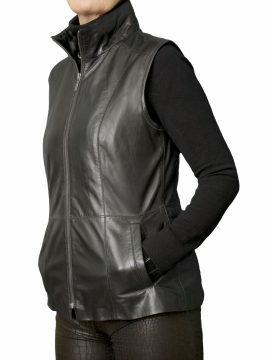 It has a front metal zip fastening that reaches to the neckline with a standard collar. There are two side slit pockets. It is fully lined. Made for Tout Ensemble by Ashwood. *** Please Note: Your Gilet bust size WILL NOT be the same as your bra size – therefore, please measure (with a good tape measure) around the fullest part of the chest. *** Please see our Product Description below for full details and important sizing information. (RRP £339.99). 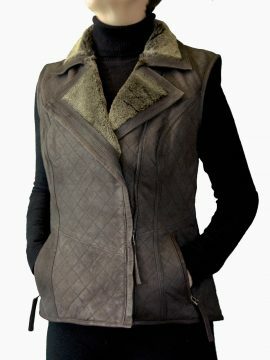 Ladies - are you looking for something smarter and more stylish than your average gilet or body warmer? Then this Barbour-style naturally windproof sleeveless leather gilet with faux fur collar and laps could be just the one for you. It has been expertly tailored from high quality brown lambskin nappa that has been buffed to give a slight matt finish. It is subtly shaped in at the waist for a stylish snug fit. Fully lined. Wear outdoors or indoors whenever you want to have that extra warmth - it is so versatile and comfortable, you may find you hardly ever take it off! *** Please Note: Your Gilet bust size WILL NOT be the same as your bra size – therefore, please measure (with a good tape measure) around the fullest part of the chest. *** Please see our Product Description below for full details and important sizing information. Elegant, beautifully tailored matching waistcoat and pencil skirt outfit/suit in finest quality, luxury soft semi-aniline nappa leather. This has a special waxed finish giving a subtle shading for added effect which can be seen on the cherry and tan leathers. Perfect for smart or smart-casual wear, day or evening. Very versatile, you can wear together as an outfit or as separate items with other accessories. (The skirt and waistcoat can also be purchased separately.) Made exclusively for Tout Ensemble to our own design. Available in black, cherry red and tan. Please read our Product Description below for full details and important sizing information. (RRP £139.99). 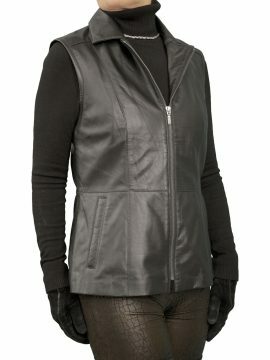 A most beautiful ladies leather waistcoat in soft lambskin nappa leather. It is styled to be a VERY snug fit when worn zipped up - but it can be left open for more room. It has a front double-zip fastening with a plunge neckline and mandarin/stand-up collar and is ruched at the front along line of zip. Fully lined. By Ashwood. *** Please Note: Your waistcoat bust size WILL NOT be the same as your bra size – therefore, please measure (with a good tape measure) around the fullest part of the chest. *** Please see our Product Description below for full details and important sizing information. (RRP £199.99). 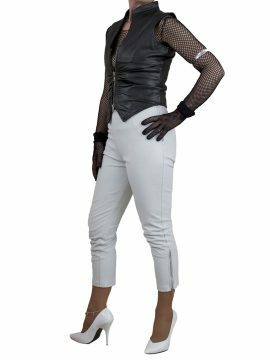 A superbly tailored ladies leather waistcoat in finest quality luxury soft semi-anline nappa leather. The leather has been given a special waxed finish which gives a subtle shading effect for added style, visible on the cherry and cognac leathers. The waistcoat is styled to be a slim fit when fastened, tapering in slightly at the waist. It features an adjustable back belt, stitching detail at the seams and 4 metal buttons for fastening at the front. Fully lined. Made exclusively for Tout Ensemble by Ashwood. This is also available as an outfit with matching pencil skirt. *** Please Note: Your waistcoat bust size WILL NOT be the same as your bra size – therefore, please measure (with a good tape measure) around the fullest part of the chest. *** Available in black, cherry red and cognac tan. (Black also available in larger sizes 42in-46in bust.) Please see our Product Description below for full details and important sizing information.